Google chrome is the full featured browser. It is growing more aggressive because of it's simple and fast. You can browse with Google Chrome for web faster, safer, and easier. It was released 2008 with in this short period it gets unexpectable responses from Internet users. Chrome is the only browser is growing day by day compare with Firefox and IE. 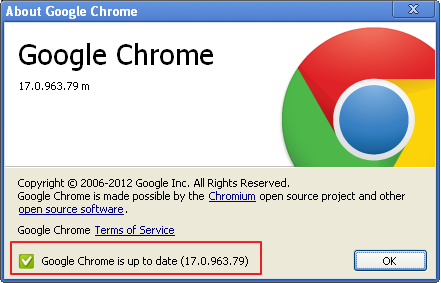 Now Google Chrome released next stable version is Chrome17.0 with some new features and bug fixed. This new version fixes issues with Flash games, along with the security fix. Normally Google Chrome updates automatically for users after stable version released. So first check your browser version. To check your Chrome version go to Settings and click About Google Chrome. The pop up windows shows your version. If your windows shows like this your browser up to date.